When it comes to loyalty and longevity in football, there are many names rightfully mentioned. 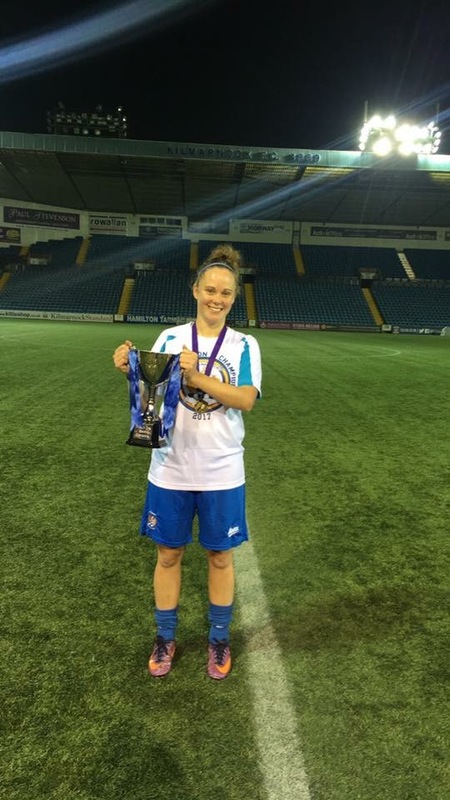 Kirsty Munro of F.C. 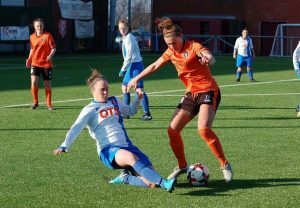 Kilmarnock Ladies is definitely a player that ticks both of those boxes and then some, and deserves our utmost respect. SK: You’ve been at Killie an amazing 23 years, right? Are you the club’s longest-serving player? KM: Yes, I am the longest-serving player and person at the club. The committee has all changed through the years so I have even been here longer than any of them. Staying with a club this long isn’t really common these days, in football people like to move on for different reasons but I have stayed loyal to Kilmarnock through the highs and the lows. SK: Can you remember when you signed for them? How did it come about? KM: Yeah, it was 1996 when I first started at Killie. I was a wee tomboy when I was younger, and loved to play football. 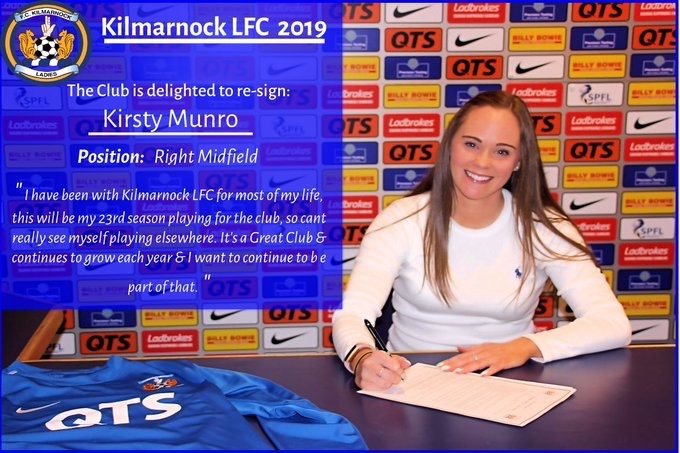 I played with a boys’ team as girls’ football wasn’t really established back then, so when my mum and dad heard about Killie having an U11s team, they took me to training and I have been there ever since. SK: Which seasons stand out and why? KM: My seasons at U13, U15 and U17 stand out as the teams were successful winning leagues, Scottish Cups and League Cups. Season 2011-2012 and 2012-2013 are also memorable for bad reasons, we had such a young, inexperienced side, that we were relegated two years in a row from the Premier League down to the 2nd division. Those seasons will always be remembered. 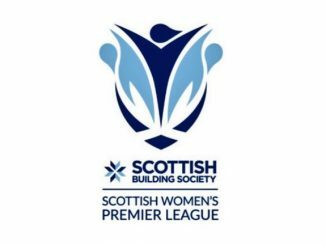 Season 2017 is also a stand out season as we won the 1st Division to be promoted back to the Premier League in SWPL2. SK: What is the biggest difference from now to when you first started playing for them? KM: The club has grown in size from when I first started all those years ago. 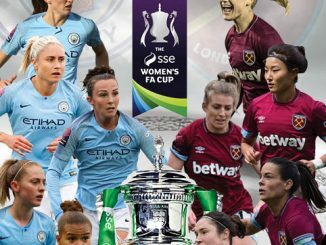 The biggest difference is that the women’s game gets more publicity these days – still not as much as the men but it is getting there. Years ago there was basically no publicity. Also the facilities we play at are much better. We get the chance to play at proper football grounds – Rugby Park is our home venue but years ago it was a public grass park or a Junior Football ground, when I first moved up to Senior Football. SK: We are sure the club and the game itself has changed a lot but what about you? How have you changed as a footballer? KM: I wouldn’t really say I have changed as a player. The older you get you read the game better which helps, and the games are more tactical and physical. From a young age I have always just wanted to get the ball and run – which I still do now. SK: Can you describe yourself as a player now? KM: I would say I am just a typical winger – like I say, I just like to get the ball and run. I use my pace to take on and get by defenders. SK: What are your personal aims for the upcoming season? KM: I just want to play as much football as possible during the season, to play to the best of my ability and help to drive the team towards success. SK: And the team’s aims? KM: Hopefully to finish as high up the table as we can. We finished 2nd in our first season in SWPL2 after being promoted so it would be great to go one better and win the league this season. Finishing top would be a great achievement for the club. I was part of the team when we played in the top flight before so it would be great to play against the top teams/players in Scotland again. We have players in the team with the ability and experience to make that achievable. SK: What’s the best thing about playing for Killie? KM: The club is like one big family and everyone looks out for each other which makes it such a great club to be a part of – probably the reason why I have been here for so long. All the teams are very supportive of each other from U11’s right to the Senior Squad – when possible we will go to watch other squads play, and the younger teams are quite often at our games to support us. The committee are also supportive and approachable. SK: What is your job outside of football? KM: I work for Kilmarnock Football Club. 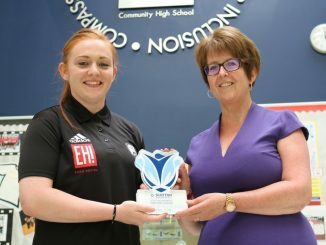 I am the Youth Academy Administrator and also deliver the Killie Kickers Programme for 3-5 year olds in the Community – My life is just football 24/7 – seven days per week! KM: Probably being capped for Scotland at U17 level. I still have my first cap framed hanging on the wall in the house. SK: When a player leaves the SWPL for a pro contract in the FAWSL in England, what are your thoughts? 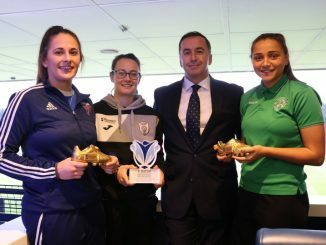 KM: Women’s football in Scotland isn’t as big as it is in England, but it just shows that there are still players of a high standard playing in Scotland if they can get a move down south. SK: What do you hope for Scotland at the WWC 2019? KM: Hopefully they can just go over to France and do well. It will be tough but the girls in the National squad have already done the country proud by getting to the World Cup so hopefully they continue what they have achieved so far.